This year marks nearly a decade since my daughter's diagnosis of Celiac Disease. At the time, I still had to comb the aisles of the health food stores and order GF oats online. Now, the chain supermarkets (and even big box stores like Target) have dedicated gluten free sections, as well as a plethora of products in every section bearing the GF symbol. The many items like prepared cookies and power bars, baguettes and bagels that tastes very much like their "glutteny" version, and cake mixes have made my life much easier. There is a wonderful event called the Gluten Free Expo, #GFEFExpo, that occurs in several cities throughout the country this year, including one near me--Secaucus on October 14th and 15th. The tickets are very reasonably priced, and give you a great day out with your family sampling new products and learning more about new foods and lifestyle issues for those who are gluten free or with food allergies (in my family that's both)! Please click this link to purchase tickets. Today is the last day to receive the early bird 30% discount off tickets (code: EARLYBIRD), and there is a 20% off deal until October 13th (code: ADVANCE). 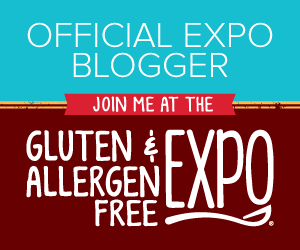 Checkout my twitter feed @glutenfreemaven, to win one of 5 free tickets I'm giving away.The best part of the expo for my kids was meeting others like them, and knowing the daily struggles with Celiac and Food Allergies are very real for so many others. Summer fruits are my absolute favorite. Whether it's stone fruits, like peaches and plums, or berries of all types, I'm in fruity bliss in the summer. I incorporated some lovely end of season blueberries into a simple cake using a store bought mix. I figured out a way to make the gluten free cake mix work for my family's allergy needs (no egg and no dairy) using a coconut vegan yogurt and margarine. I use So Delicious brand coconut milk yogurt. You may use any variety that works for you in plain or vanilla flavor. 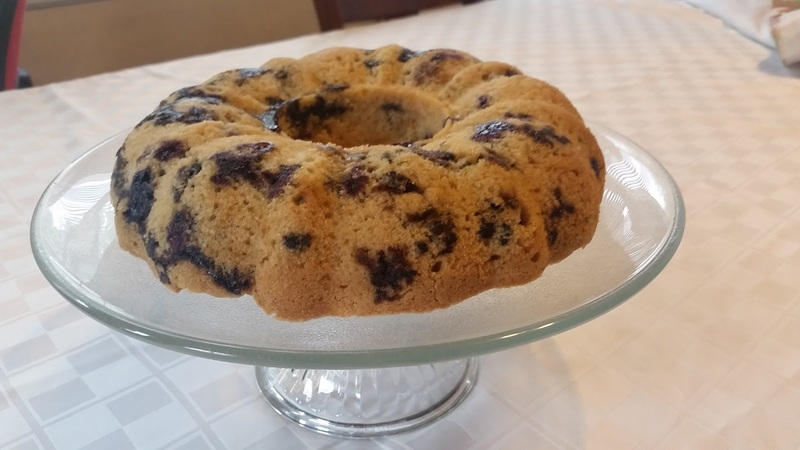 This cake works well with a variety of fruits such as diced peaches, apples or pitted cherries. The fruit shouldn't be too wet (like a strawberry). Pat the fruit dry before tossing with other ingredients to reduce adding too much moisture to the cake, resulting in a gummy texture. If you use frozen blueberries, do not thaw before baking. I used Betty Crocker brand Gluten Free Yellow Cake Mix to prepare this cake. Pre-heat oven to 350F degrees. Spray a non-stick Bundt cake pan with non-stick cooking spray, set aside. In a large mixing bowl with an electric mixer on medium speed, beat the margarine until fluffy. Add cake mix and stir. Add rice milk, yogurt, vanilla and cinnamon. Beat on medium speed for about two minutes until smooth and well combined. In a small bowl, toss together blueberries and corn starch. Remove berries and shake off extra starch. Stir berries into cake mixture. Pour mixture into prepared baking pan, and bake in pre-heated oven for 45-55 minutes. A toothpick inserted into the cake should come out clean. Set pan on a wire rack to cool. To Serve: When completely cool, turn cake out onto serving platter. Sprinkle with confectioner's sugar and garnish with additionally berries, if desired.